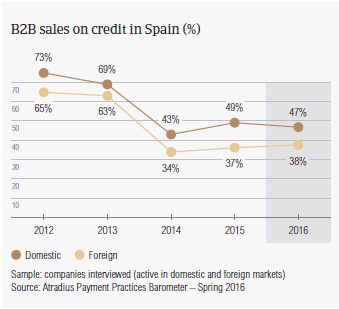 Compared to last year, respondents in Spain appear to be notably less likely to sell on credit terms to their business-to-business (B2B) customers. On average, this year, 42.8% of the total value of Spanish respondents’ B2B sales was transacted on credit (average for Western Europe: 41.2%). This against a an average of 49.3% one year ago. This relatively lower propensity to grant trade credit in B2B transactions may reflect the still challenging insolvency environment in Spain. This year, the level of business bankruptcies in the country is forecast to remain over twice as high as before the onset of the debt crisis. Compared with the other countries surveyed in Western Europe, the proportion of Spanish respondents’ B2B credit-based sales does not differ much from that of respondents in Italy, Great Britain and Ireland. Respondents in Spain seem to be notably more trade credit friendly to domestic than to foreign customers. 47.3% and 38.3% of the total value of domestic and foreign B2B sales respectively were made on credit (survey averages: 44.8% domestic and 37.7% foreign). This points to a non-uniform perception of payment risk arising from domestic and foreign B2B trade. This is a feature Spanish respondents have in common with those in Greece and Italy. 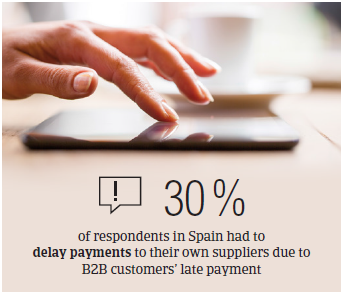 Around 87.0% of Spanish respondents (in line with the survey average) experienced late payment of invoices by B2B customers over the past year. This resulted in an average of nearly 41.8% of the total value of B2B receivables remaining outstanding past the due date (average for Western Europe: nearly 40.0%). Late payment of invoices occurred almost equally as often with domestic customers as it did with foreign customers. This is in contrast to respondents’ perception that payment risk is more likely to arise from export than from B2B trade on credit. Over the past year, default rates of Spanish respondents’ domestic and foreign B2B customers did not vary significantly. Late payment of invoices (domestic and foreign) is reflected in the Days Sales Outstanding (DSO) figure posted by respondents in Spain. This averages 52 days (survey average: 48 days) and is six days shorter than last year. This may reflect greater efficiency in collecting high value long outstanding invoices than one year ago. Fewer respondents in Spain (58.0%) than in Western Europe (63.7%) expect no change in DSO over the next 12 months. A worsening of DSO is expected by nearly 22.0% of respondents, in line with the survey average. As late payment of invoices can restrict cash flow and cause businesses to increase bank borrowing, slightly more respondents in Spain (18.7%) than in Western Europe (16.4%) are concerned about maintaining sufficient cash flow levels. Bank lending restrictions are a concern for 10.4% and 6.7% of respondents in Spain and Western Europe respectively. 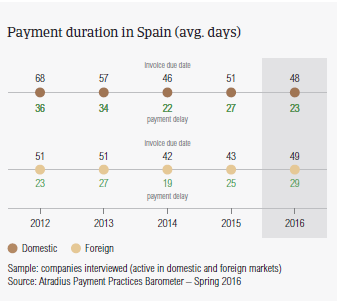 Payment terms extended to B2B customers by respondents in Spain average around 49 days from the invoice date, and are markedly above the average for Western Europe (31 days). Domestic and foreign terms do not differ. Of all the countries surveyed in Western Europe, Spain extends the most lenient terms for invoice payment to customers on export markets. Compared to last year, the average domestic payment term is slightly shorter, and the foreign one is an average of five days longer. 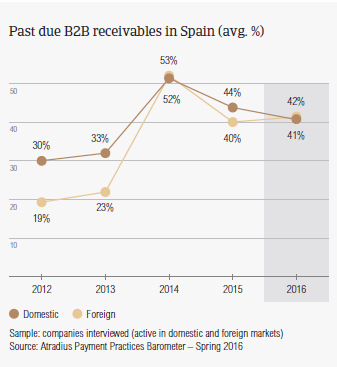 Domestic B2B customers of Spanish respondents generally settle past due payments within three weeks and foreign customers within one month of the invoice due date. This means respondents turn overdue receivables into cash in an average of 80 days from invoicing (survey average: 53 days). This is around four days longer than last year. This is consistent with concerns about maintaining sufficient cash flow levels and bank lending restrictions commented on earlier in this report. Based on responses in Spain, domestic and foreign B2B customers pay invoices late due to insufficient liquidity. The percentage of respondents reporting this in respect to domestic late payment increased to 59.5% (survey average: 57.9%) from 41.8% one year ago. Foreign late payment was reported by 37.2% of respondents, compared to 33.0% one year ago. Intentional use of outstanding invoices by customers for their financial advantage is the second most often cited reason for late payment of invoices by domestic B2B customers (27.4% of respondents in Spain – unchanged since last year – compared to 28.2% in Western Europe). In contrast, the second most frequently reported reason for late payment from customers abroad is the complexity of the cross-border payment procedure (29.5% of respondents in Spain, and 28.0% in Western Europe). No significant variation from last year. 31.9% of Spanish respondents reported (42.1% in Western Europe) no significant impact on their business as a result of late payment of invoices by customers. This would suggests that there is no tight control of credit risk. This may explain why more respondents in Spain (29.5%) than in Western Europe (23.7%) had to delay payments to their own suppliers. Around 20.0% (16.0% in Western Europe) had to cover their liquidity shortfall by increasing bank borrowing. The proportion of B2B receivables, reported by Spanish respondents as uncollectable averages 0.9% of the total B2B credit sales value in the country (average for Western Europe: 1.3%). Domestic uncollectable receivables were written off almost as often as foreign ones. Uncollectable B2B receivables originate most often from the construction, consumer durables, business services and overall services industries. 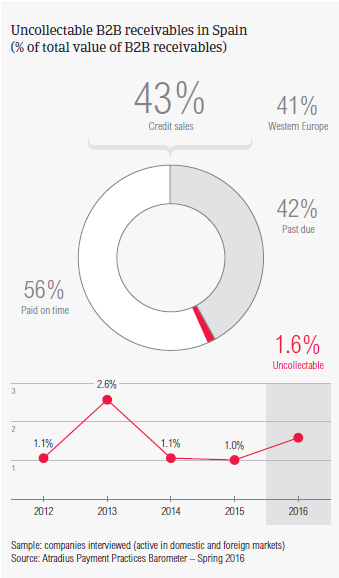 For slightly more respondents in Spain (61.3%) than in Western Europe (59.3%), B2B receivables were uncollectable mainly due to the customer being bankrupt or out of business. Write-offs were also mainly due to the failure of the collection attempts (35.0% of respondents in Spain, compared to 28.5% in Western Europe) and because the customer could not be located (26.3% of respondents in Spain, compared to 19.3% in Western Europe). Survey respondents in Spain reported granting trade credit terms mainly to B2B customers belonging to the construction, consumer durables, business services and overall services industries. Invoice payment terms extended by Spanish respondents to B2B customers in the construction industry are significantly longer than the country average (averaging two months from invoicing). B2B customers in the consumer durables sector settle past due payments the slowest (more than two weeks after the due date). An above average (for the country) proportion of overdue invoices was generated by the construction and services industries. According to most of the respondents, (58.0%) this is likely to be chiefly due to liquidity constraints of customers in these industries. 39% of the respondents said the liquidity problems resulted in insolvency of the customers. Nearly 40% of the respondents in Spain expect payment practices of B2B customers in the consumer durables industry to deteriorate slightly over the next 12 months. No significant change is anticipated in respect to payment practices of other industries. Profit margins in the consumer durables retail industry have generally increased in 2015. Payments in the construction sector still take more than 100 days on average.